Often times, when a movie sports a large and talented cast, the names are there to hide a mediocre script. But, on the other hand, sometimes when a movie sports a large and talented cast because it is a Steven Spielberg historical picture, you know you are in for a treat. LINCOLN, of course, is the latter. The Oscar which Daniel Day-Lewis run for his portrayal of Lincoln was his third, and it was richly deserved. I watched LINCOLN (2012) on 3.8.14. It was my first viewing of the film. Before writing a script about America’s 16th President, the creative team must decide what era of his story they would like to tell. In 1930, DW Griffith attempted to tell his whole life story in 90 minutes with the film ABRAHAM LINCOLN. When the great John Ford decided to tell a story about Lincoln in 1939, he created a fictionalized story which told of a case from before Lincoln became president called YOUNG MR. LINCOLN; a movie which depicted the greatness which preceded his fame. A year later, the more accurate 1940 movie ABE LINCOLN IN ILLINOIS told the story up to Lincoln’s election as President. And, of course, in 2012 Timur Bekmambetov went with the true story of Lincoln battling the undead in ABRAHAM LINCOLN: VAMPIRE HUNTER. Thinking, for some reason, that Bekmambetov’s vision was not accurate, Spielberg’s film arrived in theaters five months later. The script for this latest LINCOLN was written by esteemed playwright Tony Kushner and partially based on the book A Team of Rivals by Doris Kearns Goodwin. In creating this vision, Kushner and Spielberg decided to tell a more narrowly scoped story. The film starts in January of 1865. Lincoln (Daniel Day-Lewis) has been reelected. The Civil War is coming to a bloody end. Having been reelected, Lincoln is trying to get the 13th Amendment, the freeing of all slaves, done before the war ends because a reunified country would never have enough votes to pass the legislation with the south back in the government. The final vote happens at the end of the month. Thus, the entire film (save for a final scene which involves Lincoln’s assassination) takes place in the course of a month. The conflicts are many. Lincoln’s wife Mary Todd Lincoln (Sally Field) is still a mess a full three years after the death of one of their three sons. Her depression can be nasty, and she takes it out on Abraham. Yet, despite the seemingly quiet animosity, much of what Lincoln does seems geared towards satisfying her. When their eldest son Robert (Joseph Gordon-Levitt) decides he must join the army, the film depicts the President’s final push to get the amendment passed (and thus end the war) as being at least partly motivated by the wrath he will incur from his wife if it does not pass. Lincoln is also regularly at odds with his cabinet. His most trusted advisor is William Seward (David Strathairn), though Lincoln doesn’t disclose all to him. Other members in his cabinet argue regularly, and some seem to hold him in disdain. Historically, Lincoln didn’t pick just allies to be in his cabinet because he felt it important to have varying viewpoints. The most central conflict in the film, however, has to do with the House of Representatives. The Republicans are fractured until Lincoln cuts a deal with Preston Blair (Hal Holbrook) to bring some southerners up to negotiate peace. This proves the film’s ticking time bomb, as the amendment is seen as the end of the war and will not pass if the southern contingent arrives to negotiate peace. The most vocal member of the Republicans is Thaddeus Stevens (Tommy Lee Jones) who is a staunch abolitionist having trouble playing the political game. His chief rival is the pro-slavery Democrat Fernando Wood (Lee Pace) who is great at whipping the crowd into a frenzy. A team of under the table guys are brought in (led by James Spader) to try and turn as many Democrats as they can. Lincoln needs 20 votes from that side of the aisle to pass the amendment. It seems an impossible task. Despite all these conflicts, the film still takes plenty of time to consider Lincoln as a family man. His son Tad (Gulliver McGrath) is the young ‘favorite’. Abe spends much of his spare time with him, and seems to prefer Tad’s company over his wife’s. Abe has a more complex relationship with the older Robert, if only because Robert’s age and opinions make their relationship less easy. We still see Abe being a dad, though, as he tries to be there for Robert as much as possible. The tragedy of Lincoln, the man as well as the movie, is that this wonderful gentleman’s life was cut so short when he still had so much to give to both his family and his country. 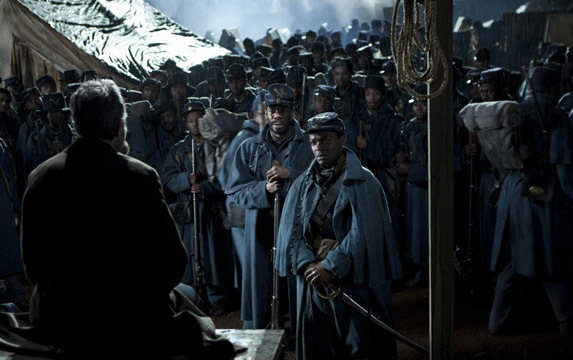 Other vital scenes has Lincoln interacting with ordinary people and soldiers. Lincoln listens to an African-American who laments his people’s inability to move up the ranks. He has a philosophical discussion with the young men who send out his telegrams. He visits a war hospital and expresses concerns about the quantity and quality of their food. He listens to all, aiding the depiction of a man who did not consider himself above others, even as he made command decisions. Lincoln was not afraid to question the legality of his decisions in private, making the case that the Emancipation Proclamation could very well be legal, but that he made the decision based on morality. The acting in this is stellar. Everyone is at the top of their game, and Day-Lewis blends into the role the way he always does. Watching him act is to forget him from anything else and to just believe what he appears to be on screen. The script is wonderfully balanced and quickly moving. This is a two and a half hour film that feels half that length. The attention to detail (the sound of Lincoln’s watch is the actual sound recorded from his actual watch) is striking, there is a never a ‘modern’ moment which pulls from the focus even as much of what is discussed has absolute baring on political discussions of modern times. This is among Spielberg’s best work. The film is tight, moving, and impactful. It is an instant classic in the historical drama genre. ~ by johnlink00 on March 9, 2014. Glad you liked it John. Really great film and shows Spielberg still has it! And DDL deserved all the praise he was showered with. When Spielberg goes historical, wether this, Saving private Ryan, or Schindler’s List, etc. it is amazing to see that he is as good at that stuff as he is at entertaining with his lighter stuff. Great review. I agree this is a very good movie. Instant classic? I’m not sure I’d go that far, but I like it all the same. For me it is an instant classic in that genre. But I certainly understand that it isn’t an automatic. Everybody here who shows up is great, but once again, it’s DDL who shows his true power and his capability of making a legend, seem like more human than ever before. Good review John. Thanks! DDL initially turned it down because he didn’t connect. He later said he connected with Lincoln more than any one else he’s played. Interesting how that works, haha.